Last night at the camp we found ourselves asking important questions like is Donald Trump really black on the inside? And why do all the children want to eat his brain? Flash backwards in time six hours and you will find me driving winding mountain roads as slowly as I possibly can in my all wheel drive Subaru which is basically not built to drive 30 miles per hour through all those fun S curves. But I did it. 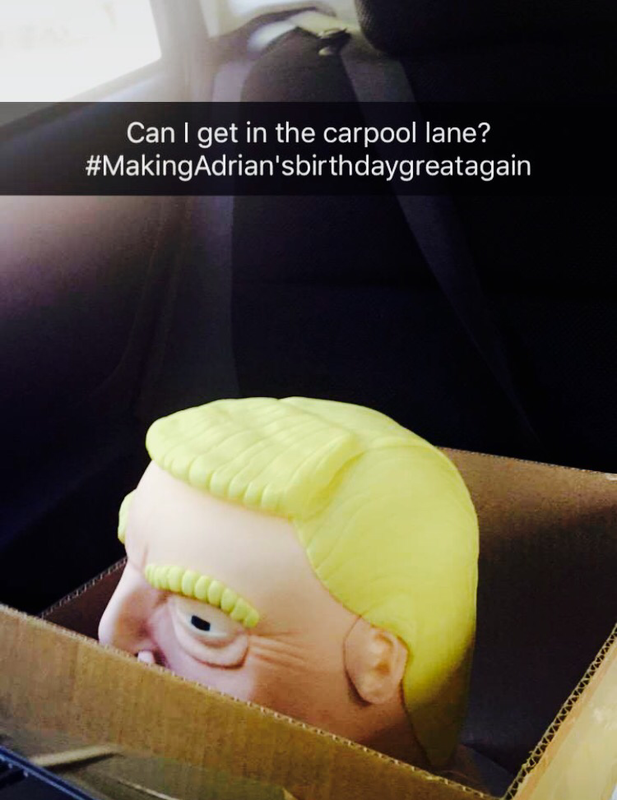 When I first looked into hosting a Donald Trump themed birthday party for my amazing and very patriotic boyfriend I was imaging a sheet cake with a drawing of Donald Trump on it and the words “Making Adrian’s birthday great again” I was not expecting a life-size and slightly creepy naked bust of our president. I was also not expecting Donald’s neck to break as I was driving, seriously, slower than my grandma on the way from Lake Arrowhead to Big Bear Lake. Five miles after I started the journey, all of a sudden I heard a noise from behind me and when I turned and looked at that creep in my backseat his big yellow hair was definitely tilted to one side. Oh poop, I thought after I pulled over to the side of the highway and checked out the dark chocolate cake oozing out of his naked pink chest. 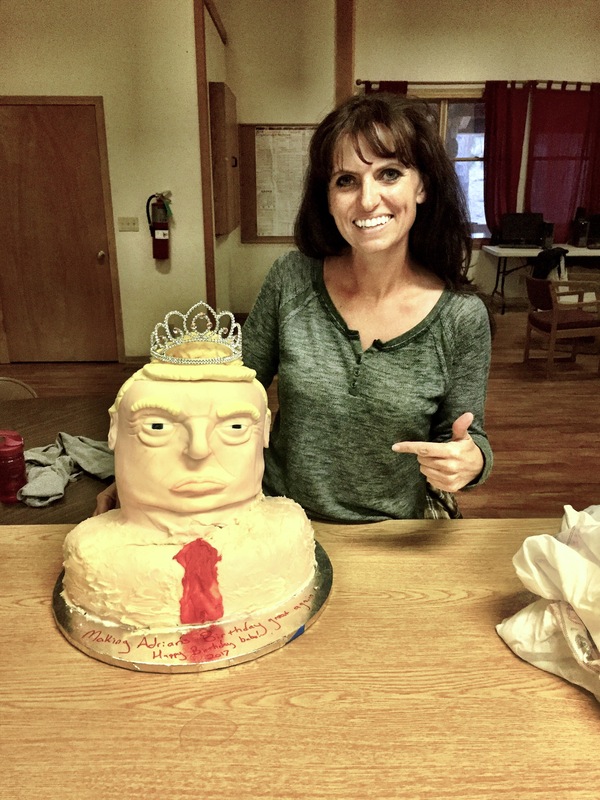 My Donald Trump cake may be falling apart hours before the party, but it was going to be super hilarious that my Donald Trump cake was black on the inside. I knew that transplanting the cake throughout forty miles of winding mountain roads was going to be a challenge as I had to put off picking up the cake the night before when it was still frozen and The Donald would have been way more sturdy if I could have transferred him in a mostly frozen state. But I had no idea how “Yuge” he would actually be and he didn’t actually fit in my moms freezer where he was supposed to reside for Friday night. And that’s how I found myself staring at The Donald’s broken neck, askew in the backseat despite being buckled in tight. I stared at his pink naked body in disbelief and I still didn’t quite understand how I ended up with a naked birthday cake (If I had ordered a naked birthday cake wouldn’t I remember saying the word naked?) Then I got a text from my brother as I sat on the side of the road asking me if I liked my birthday suit version of The Donald. My brother’s mother in law is the one who makes the cakes and I guess my bro thought it would be a funny joke to play on me to tell his mother in law I wanted a naked bust of the president. Do these kind of things happen in other families or just mine? Luckily I had a thirty minute extremely slow drive the rest of the way up the winding highway to Big Bear and it gave me time to think..
Frosting! Always the answer! Not only would I clothe Donald but I would save his broken neck! I planned to refreeze him when I got home then make white butter cream frosting and make him a dress shirt and a red tie. I did this with the help of a twelve-year-old in what can only be described as and afternoon of arts and crafts/ political science. This birthday cake/ statue is like Big Bear’s version of Michelangelo’s David but way more political and way less Renaissance. Frosting came to the rescue after a few hours in the freezer for The Donald and soon we were off roading to the camp for the birthday party. Yes, that’s right, after every thing else I put The Donald through that day, he also had to off-road for four miles up to the camp to be consumed by a bunch of very hungry children who fought over who could eat his brain and who gets to eat his eyeballs. I feel like this cake will be the talk of Big Bear Middle School on Monday morning. The cake was delicious and many selfies were taken. At some point some one put a tiara on the president which made us all think, maybe he is cool with this whole transgender topic. Then we cut the cake open to reveal delicious dark chocolate and thought, imagine that, Donald Trump is black on the inside.